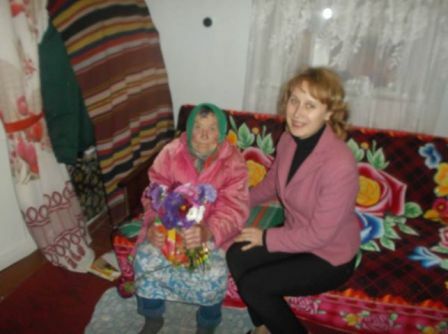 In a sunny September day, when the golden autumn had just started to light the treetops with bright colors, a resident of the picturesque village Verbivka, Chornonos Natalia Afanasivna, celebrated her 90thanniversary. This is a person with sincere soul and big heart. Her warmth and humanity melt the ice of our everyday life. All her life Natalia Afanasivna devoted to agriculture. In summer her working day started before the sunrise. Her first rays she met on the road to the livestock farm, which for 60 long years became native for her. She is a highly skilled specialist and has an excellent memory even now. Job seniority of Natalia Afanasivna makes up more than 60 years. Pleasant for her became greeting from the deputy of Ukraine Grygorii Kaletnik.